In the computer gaming world, the genre of racing games exists in a league of its own. Most other genres of games -- first person shooters, role playing, sports, construction and management simulation, you name it -- can be played well with a keyboard and mouse. In fact, I would argue games like first person shooters are best played with a keyboard and mouse as opposed to a gamepad. But when it comes to racing games, playing with a keyboard is possible, but you are going to be missing out, whether it is on the simulation experience or simply the feasibility of doing so. Since I like driving in real life, it should come at no surprise I am a big fan of racing simulators as well. When I saw the Logitech G920 racing wheel on sale for half price at a popular online retailer recently, I simply could not pass up the deal and snatched it up immediately. The Logitech G920 is regarded as one of the best racing wheels in the market today; combined with Project Cars 2 and my TV-as-a-monitor setup in my basement, the racing experience was very commendable. But what about those people who only play racing games casually and are not dedicated enough to own a racing wheel? A company called Aimpad proposes a solution. It works by adding an infrared LED sensor underneath the switches on a standard mechanical keyboard and measures how far down a key has been pressed; effectively turning regular Cherry MX switches into an analog-capable input button. The best part is it does not change the functionality or feel of the keyboard at all. Aimpad has also signed an exclusive two-year contract with Cooler Master, and one of their first keyboards as a result of this partnership is the MK850. How is this keyboard, and is it as awesome as it sounds in games like Project Cars 2? Read on to find out! Our review unit of the Cooler Master MK850 came in a large brown corrugated cardboard box from Cooler Master's American headquarters in Brea, California, USA. Cooler Master sent us such a large package because they also threw in the Cooler Master SK630, CK530, MK730, and MasterMouse MM830; all recently released products. Using FedEx International Ground, everything arrived in great condition to us here in Calgary, Alberta, Canada for our review today. The retail box design for the Cooler Master MK850 is an updated interpretation of the company's "Make it Yours" campaign. The black background is complemented by mainly white text for maximum contrast along with a burst of purple to help you remember who made it. Cooler Master's logo and slogan is at the top left corner, backlight activated image of the keyboard is printed across the center, and the model name and product description are located at the bottom left corner. On the opposite corner, three icons indicate its Aimpad technology, RGB backlighting, and Cherry MX switches, respectively. Our particular unit has Cherry MX Red switches. Feature highlights can be found on the remaining sides of the box. Smart cable manager: Yes, 180 degree, 3 ways. Out of the box, you will receive everything you need plus a few other things that are really nice to have. Securely placed inside the box is the Cooler Master MK850 keyboard itself behind a clear plastic cover. It even comes with a detachable PU leather wrist rest. A keycap puller and fourteen purple PBT double injection keycaps are placed inside a sealed vacuum bag. The extra keycaps are QWERASDF, Esc, M1 to M5, and the arrow keys. A USB Type-C to USB Type-A cable is included inside a separate compartment at the bottom. On the product literature side, you will find a quick start guide that shows you what some function key combination do as well as an Aimpad calibration manual. Cooler Master has many clean looking keyboards, but the MK850 is one that fits APH Networks' design philosophy. It carries a clean, practically reference layout -- meaning no crazy designs -- with OEM Cherry MX keyswitches, media buttons at the top, RGB LED backlighting, and a detachable wrist rest. The MK850 checks all the boxes and adds Aimpad technology to the QWERASDF keys. The five dedicated buttons at the top are play/pause, next, previous, mute, and LED on/off. There are two programmable metal wheels next to it, which are mapped to adjusting the LED backlight brightness and volume, respectively, by default. Meanwhile, the exposed gunmetal colored brushed aluminum backplate is great to look at. It even hides fingerprints well. The sides and bottom are all made out of quality plastic. Overall, I am a big fan of the looks and the aluminum backplate is solid. There is little perceivable flex in the keyboard and feels excellent in everyday use. My only complaint is there is noticeable lag when using the wheel to adjust LED backlight brightness, which can be annoying if you are doing it quickly. The Cooler Master MK850's wrist rest is fully detachable from the main unit. It is designed to be attached to the keyboard by magnets. This means if you lift the keyboard off your desk, it is going to fall, but otherwise I think this is a great design for normal use. The wrist rest is made out of plastic and has a polyurethane leather surface with foam padding on the inside, making it very comfortable to use. It protrudes comfortably for my average sized hands. When placed on the table, the wrist rest will move from side to side if you push it, but there are six rubber grips at the bottom to help reduce the effect. The Cooler Master MK850 measures in at 494mm width, 268mm depth, and 55mm height. The wrist rest accounts for about 90mm in depth according to my measurements. This is slightly deeper and wider than a standard QWERTY keyboard due to the top bar and side buttons. To go along with its medium footprint and medium profile, the keyboard weighs about 885g according to the manufacturer. This is surprisingly lightweight for a mechanical keyboard. Once you turn off the lights and activate the Cooler Master MK850's RGB backlit keys, the keyboard really shines -- no pun intended. The font is large and easy to read. The MK850 features full independent key RGB backlighting when you use it with software. The RGB backlight and macros can be programmed or adjusted on-the-fly without software as outlined in the user manual. A dedicated ARM Cortex M3 is inside to run complex lighting effects like the built-in snake game. I am a big fan of fully backlit keyboards and I am happy Cooler Master designed the MK850 with this feature. The Cooler Master MK850's key illumination distribution is reasonably even for the most part. The area between the keys are also backlit thanks to the reflection of the LEDs, and I like it. One thing to point out, for keys with more than one line of text label, you will notice the top half is significantly brighter than the bottom half. This is due to physical design limitations of Cherry MX stems, as you can see in our photo above. On the left, five Aimpad profile keys labeled M1 to M5 allows you to switch between standard, first person shooter, driving/flying, advanced flying, and speed modes, respectively, where the latter gives high actuation points on all Aimpad keys. Hitting the Function key along with the labeled F1 through F8 buttons and arrow keys allow you to do things like cycling through different lighting effects picking individual lighting channel intensity. Fn and the arrow keys control the lighting effect speed and direction. Fn in combination with F10 to Pause are for macros. You can even switch profiles, stored on the keyboard's 512KB internal memory, by going through Fn in concert with 1 to 4. Fn in combination with F9 is toggles Win Lock on or off. Win Lock is an important feature in any gaming keyboard, because let us face it: How many times have you tried to duck in your favorite FPS while engaging an enemy, only to be killed instantly, because you missed the "Ctrl" key and your game was minimized? Hit the same key combination again and you can even lock the whole keyboard. The extra-flat acrylonitrile butadiene styrene (ABS) plastic keycaps are of average quality. Polybutylene terephthalate (PBT) keycaps such as the purple ones found in the package are stiffer, harder, and has better color retention, but the ones found on the Cooler Master MK850 by default are smooth and feels nice on the fingers despite showing a bit of oily marks. It would be nice if all the included keycaps were double injection PBT keycaps. Almost everything here is pretty standard in terms of layout with a few additions. I prefer the single row Enter key layout as present on our US QWERTY Cooler Master MK850. Keyboards with a double row Enter key usually means the "\" button is moved to the left side of the right "Shift" key; reducing the size of the latter. I am more used to having a full width Shift on the right and a half height Enter. Obviously, this is more or less personal preference, but having a half height Enter key makes a lot more sense to me. Above the numeric keypad are three buttons to configure and adjust the sensitivity of the Aimpad keys. The Cooler Master MK850 has no dedicated lock indicator LEDs. Instead, the LED backlight for the caps lock and scroll lock button will turn on and off depending on the current lock status. One omission I noticed is the backlight for the Windows key will not turn off when Windows lock is activated. Even more confusing is when the full keyboard lock is activated; everything looks exactly the same. Those who are not familiar with their MK850 could be left wondering why their keyboard stopped working. If you do not know what a mechanical keyboard is, there are three main types of keyboards in the market today. The cheapest is the membrane keyboard, which is the easiest to make, but also has poor typing feel and response due to squishy keys. A scissor switch keyboard has its own independent keyswitch mechanism for each key, which delivers improved tactile response and typing experience. Modern scissor switch keyboards can be very good for everyday office use. Mechanical keyboards such as the Cooler Master MK850 costs the most, because each keyswitch is an independent part. Surprisingly, the Cooler Master MK850 with Cherry MX Red mechanical switches is pretty quiet during operation. Although the sound pitch was different, the overall noise level was comparable to the HyperX Alloy Elite RGB. Cherry MX Red, like the MX Black, is marketed as a gaming type switch. The maximum key travel distance is 4mm, with actuation at 2mm. With an actuation force of 45g in a completely linear fashion, it is about 15g lighter than the MX Black; generally speaking, the Cooler Master MK850 will feel very different than other non-mechanical keyboards. This keyswitch is desirable for gaming, because you will be bottoming out all the keys anyway, but the lack of the "bump" of the Cherry MX Red may not appeal to everyone. It is rated for fifty million operations like other Cherry MX switches. The base is rock solid and among the best I have seen as aforementioned, so you will not get any keyboard flex, which is excellent. One of the most unique features of the MK850 are its Aimpad enabled keys, of whom the manufacturer Cooler Master has a two-year exclusive agreement with. Once enabled by pressing M2, M3, or M4, games will see the QWERASDF keys as the left analog stick of an Xbox 360 controller. The feel of the mechanical keys does not change; instead, the input is controlled by how far down the keys are pressed. The entire 4mm of key travel can be detected. The sensor is an infrared LED mounted underneath the switches on the printed circuit board. I love the non-intrusive way it is implemented, and the sensitivity can be adjusted to your liking. To see how well it works, I tried it out in Project Cars 2. The experience was certainly no Logitech G920, but it is heck a lot better than a plain old keyboard. The Cooler Master MK850 is a full NKRO keyboard. NKRO stands for N-key rollover. If you have used keyboards with limited NKRO capabilities, you may have experienced ghosting issues in the past; where when too many keys are pressed at the same time, your system unable to register any more strokes. A full NKRO keyboard like the Cooler Master MK850 overcomes this by independently polling each key, making all inputs detectable by the hardware regardless of how many other keys are activated at the same time. This mean in the event you have every other key on your keyboard depressed, it will still register the last stroke. While this is a highly unlikely scenario, since you have only ten fingers, this is as good as it can get. At the back of the Cooler Master MK850 is the USB Type-C cable lead out. It comes out in the center and is detachable. The cable can be routed through the left or right side of the keyboard in addition to the middle thanks to the integrated tracks. This braided cable is of average thickness and extends 1.8m in length to connect to your computer via one standard, non-gold-plated USB Type-A connector. When we bring about the question of whether gold plated connectors are actually useful or not, let us just say if it was the actual pins, then possibly -- since gold offers better conductivity than other metals. This theoretically establishes a better connection with your computer, but on a digital signal level, we must understand it is a discrete one or zero; if anyone tells you they can tell the difference, you can defeat their theory with a double blinded test. Additionally, if you are referring to the gold part of the connector you see on the plug, I would like to point out it does not make any physical contact electrically with your computer. In other words, it is nice to have and it is pretty to look at, but it is not anything significant on a practical level. The lack of a gold-plated USB connector will not have any performance impact on the Cooler Master MK850. At the bottom are five rubber pads to help the MK850 stay in place during intense gaming sessions, plus two very small pads next to the center cable lead-out track. The two flip-out risers at the front tilts the keyboard up for those who prefer it, and are rubber lined to maintain traction. You can see two USB ports in the photo above. There are no keyboard drain holes, so it is advisable to keep your Mountain Dew at a distance. The Cooler Master MK850 works along with a version of Cooler Master Portal V1.5.4, which is a 56MB download from the company's website at press time. This program unifies some of your Cooler Master peripherals into one application, but it is a bit confusing since there are two versions and each is only compatible with a mutually exclusive subset of products. Functionally, they both look the same. Once the program opens, it will detect the products you own and download additional content specific to your models. The keyboard firmware can be updated from here as well. All settings are stored on the keyboard's 512KB internal memory for up to four profiles. The main configuration window is separated into five tabs. The first tab, Aimpad, is where you can play with the sensitivity settings of Aimpad profiles M2, M3, and M4, as shown in our screenshot above. The second tab, LED, allows you to select RGB lighting effects and colors. The Macro tab allows you to program macros. 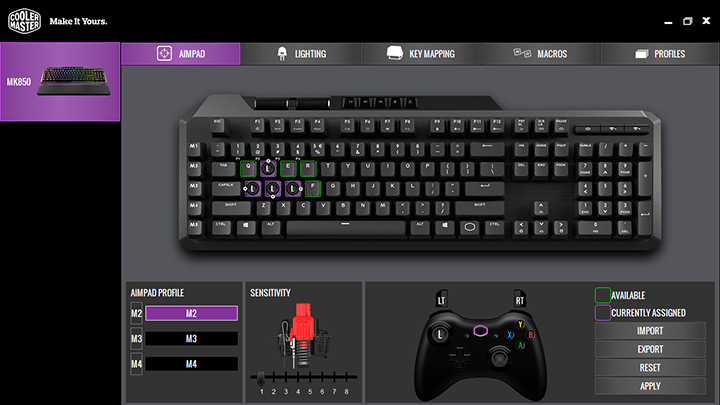 Key Map shows a picture of the keyboard, where you can select individual keys and change their functions. Profiles is where you can import and export the four profiles stored on the keyboard's internal memory. Overall, I found Cooler Master Portal to be basic, but it is very straightforward and easy to use. It is certainly not as powerful as Corsair's iCUE or SteelSeries' Engine. In fact, you can do most of the things directly on the keyboard without software, but my overall experience was positive. If I could say only two things about the Cooler Master MK850, it would all come down to it being excellent in its own right and innovative in a time where everybody and their mom sells a mechanical keyboard. The MK850 is excellent in its own right because, simply put, it is well-designed and well-made. It has a clean, practically reference layout, OEM Cherry MX keyswitches, media buttons at the top, RGB LED backlighting, and a comfortable PU leather detachable wrist rest. The aluminum backplate is good looking and does not flex; Cooler Master uses quality plastic everywhere else. The MK850 features 512K of internal memory to store your settings profiles and a dedicated processor to keep the complicated effects running. It is up to date with a USB Type-C port instead of whatever version of USB the engineer feels like using at the time. It even comes with not one, but two programmable metal scroll wheels to do things like changing the volume or adjusting the backlight brightness. Furthermore, the MK850 is innovative in a time where everybody and their mom sells a mechanical keyboard because of the Aimpad enabled QWERASDF keys. It is new on the market and exclusive to Cooler Master for the next two years, and in my tests, it worked quite well in simulating an analog input device by the means of depressed distance. I do have a few suggestions for improvement, however. First, there should be some sort of visual indicator when Windows or full keyboard lock is engaged. Secondly, reduce the lag when adjusting the keyboard backlight brightness using the scroll wheel. Thirdly, having all PBT keycaps would be better rather than just a select few. All these aside, for $200 MSRP at press time, the Cooler Master MK850 is an innovative and all-round excellent mechanical keyboard. Cooler Master provided this product to APH Networks for the purpose of evaluation. 8/10 means Definitely a very good product with drawbacks that are not likely going to matter to the end user. 7/10 means Great product with many advantages and certain insignificant drawbacks; but should be considered before purchasing. Please note that the APH Numeric Rating system is based off our proprietary guidelines in the Review Focus, and should not be compared to other sites. The Cooler Master MK850 is an excellent mechanical keyboard in its own right that breathes a fresh air of innovation with its Aimpad technology enabled keys. Do you have any comments or questions about the Cooler Master MK850? Drop by our Forums. Registration is free, and it only takes a minute! posted 1 day and 21 hours ago, with 1 posts. posted 1 day and 21 hours ago, with 7 posts. posted 1 day and 21 hours ago, with 6 posts. posted 1 day and 21 hours ago, with 14 posts. posted 1 day and 21 hours ago, with 58 posts. posted 1 day and 21 hours ago, with 13 posts. posted 1 day and 21 hours ago, with 10 posts. posted 1 day and 21 hours ago, with 12 posts.